Americans as young as 4 years old are being leg shackled, handcuffed, tasered and held at gun point for not being quiet, not being orderly and just being childlike—i.e., not being compliant enough. Americans as old as 95 are being beaten, shot and killed for questioning an order, hesitating in the face of a directive, and mistaking a policeman crashing through their door for a criminal breaking into their home—i.e., not being submissive enough. And Americans of every age and skin color are being taught the painful lesson that the only truly compliant, submissive and obedient citizen in a police state is a dead one. It doesn’t matter where you live—big city or small town—it’s the same scenario being played out over and over again in which government agents, hyped up on their own authority and the power of their uniform, ride roughshod over the rights of the citizenry. In turn, Americans are being brainwashed into believing that anyone who wears a government uniform—soldier, police officer, prison guard—must be obeyed without question. Most police shootings can be avoided. It comes down to respect for authority and obedience. If a police officer tells you to stop, you stop. If a police officer tells you to put your hands in the air, you put your hands in the air. If a police officer tells you to lay down face first with your hands behind your back, you lay down face first with your hands behind your back. It’s as simple as that. Even if you think the police officer is wrong—YOU OBEY. Clearly, Graham’s message resonated with a core group of Americans: almost 200,000 individuals “liked” the message on Facebook, with an astounding 83,000 fans sharing his words of advice with their own friends, none of whom seem to recall that Jesus Christ, whom they claim to follow and model their lives after, not only stood up to the police state of his day but was put to death for it. In other words, it doesn’t matter if you’re in the right, it doesn’t matter if a cop is in the wrong, it doesn’t matter if you’re being treated with less than the respect you deserve. If you want to emerge from a police encounter with your life and body intact, then you’d better comply, submit, obey orders, respect authority and generally do whatever a cop tells you to do. In this way, the old police motto to “protect and serve” has become “comply or die.” As I point out in my book A Government of Wolves: The Emerging American Police State and in my forthcoming book Battlefield America: The War on the American People, this is the unfortunate, misguided, perverse message being beaten, shot, tasered and slammed into our collective consciousness, and it is regrettably starting to take root. Despite the growing number of criminal charges (ranging from resisting arrest and interference to disorderly conduct, obstruction, and failure to obey a police order) that get trotted out anytime a citizen voices discontent with the government or challenges or even questions the authority of the powers that be, the problems we’re experiencing in terms of police shootings have little to do with rebellion or belligerence or resistance. Rather, the problem arises when compliance doesn’t happen fast enough to suit the police. Martese Johnson, a 20-year-old college student, unarmed and in the process of walking away from a bar where he’d just been denied entry for being underage, was tackled by police and had his head slammed to the ground and bloodied, allegedly for being intoxicated, belligerent and using a fake ID. Johnson, who it turns out was polite, had a legal ID and was not drunk, survived the encounter after 10 stitches to his head. And then there was Christopher Lollie, who was tasered, arrested and charged with trespassing, disorderly conduct and obstruction of the legal process for refusing to identify himself to police while waiting to pick his children up from their daycare. Footage of the encounter shows Lollie asking, “Why do I have to let you know who I am? I don’t have to let you know who I am if I haven’t broken any laws.” The charges against Lollie were eventually dropped. Nicholson, Johnson and Lollie aren’t the only Americans being taught a hard lesson about compliance at the end of a government-issued gun. World War II veteran John Wrana, 95 years old, dependent on a walker to get around, and a resident of an assisted living center, was rushed by five police officers—one with a Taser and riot shield, others with handguns and a 12-gauge Mossberg pump shotgun—after refusing treatment for a urinary tract infection and brandishing a shoehorn. One of the officers, allegedly fearing for his safety, fired multiple beanbag rounds at Wrana at close range, who bled to death from internal injuries. 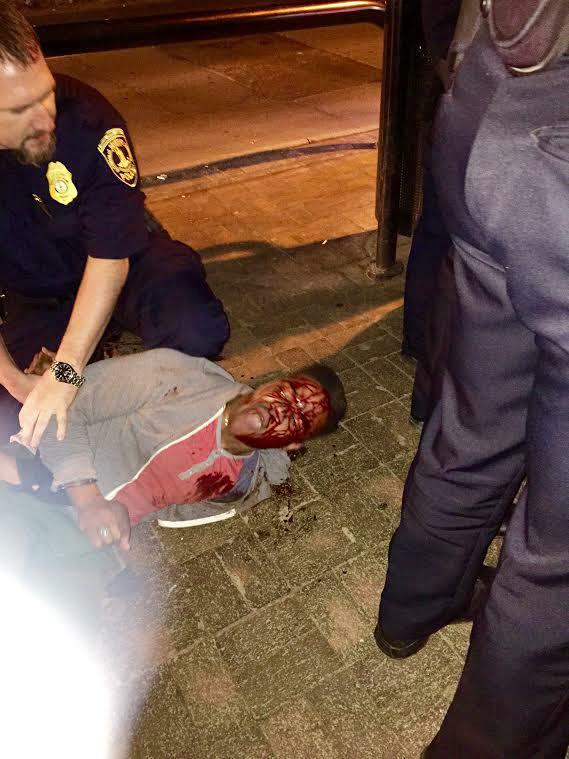 Martese Johnson, slammed and bloodied by ABC police. James Howard Allen, 74 years old and recovering at home from a surgery, was shot and killed by police who were asked by family members to do a welfare check on him. When police crashed through the man’s back door, they found Allen, perhaps having just awoken and fearing a burglary, armed with a gun. These shootings and deaths, and many more like them, constitute a drop in the proverbial bucket when it comes to police killing unarmed American citizens, and yet you’d be hard-pressed to find exact numbers for how many unarmed citizens are killed by police every year. Indeed, while police go to great lengths to document how many police are killed in the line of duty, police agencies aren’t actually required to report the number of times police officers engage in homicide. Suffice it to say, however, that the numbers are significantly underreported. One website estimates that police kill on average three citizens a day in the United States. In 2014, 1100 individuals were killed by police in the U.S. That’s 70 times more than other first-world nations, and almost 20 times more than the number of U.S. troops killed in the same year in Afghanistan and Iraq. Rarely are these officers given more than a slap on the wrist. More often than not, they operate with impunity, are shielded from justice by the governmental bureaucracy, and are granted qualified immunity by the courts. Now it’s one thing for those who back the police—no matter what the circumstance—to insist that if you just obey a police officer, you’ll be safe. But what happens when compliance isn’t enough? What happens if you play it safe, comply and do whatever a police officer tells you to do, don’t talk back, don’t threaten, and don’t walk away—in other words, don’t do anything that even hints at resistance—and still, you find yourself staring down the wrong end of a government agent’s gun? After all, the news is riddled with reports of individuals who didn’t resist when confronted by police and still got tasered, tackled or shot simply because they looked at police in a threatening manner or moved in a way that made an officer “fear” for his safety. What more could Jones or anyone have done to protect himself in that situation? How does a citizen protect himself against a police officer’s tendency to shoot first and ask questions later, oftentimes based only on their highly subjective “feeling” of being threatened? The short answer is you can’t. The assurance of safety in exchange for compliance is a false, misguided doctrine that has us headed towards a totalitarian regime the likes of which the world has seen before. Rest assured, if we just cower before government agents and meekly obey, we’ll find ourselves repeating history. However, history also shows us a different path, one that involves standing up and speaking truth to power. Jesus Christ walked that road. So did Mahatma Gandhi, Martin Luther King Jr., and countless other freedom fighters whose actions changed the course of history. Indeed, had Christ merely complied with the Roman police state, there would have been no crucifixion and no Christian religion. Had Gandhi meekly fallen in line with the British Empire’s dictates, the Indian people would never have won their independence. 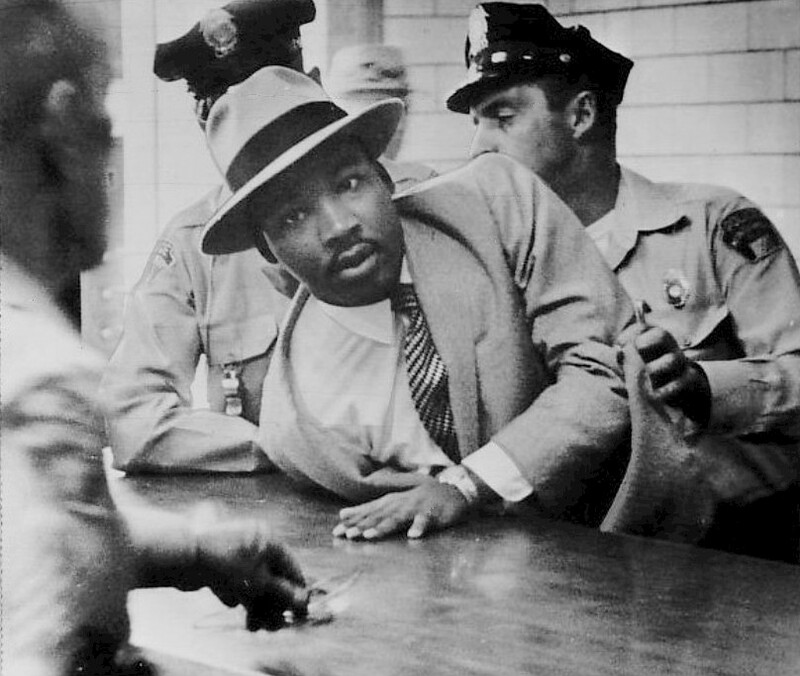 Had Martin Luther King Jr. obeyed the laws of his day, there would have been no civil rights movement. And if the founding fathers had marched in lockstep with royal decrees, there would have been no American Revolution. The long answer, therefore, is that we must adopt a different mindset and follow a different path if we are to alter the outcome of these interactions with police. No matter what path you follow, it will be fraught with peril. America is in the midst of a nervous breakdown, brought about by prolonged exposure to the American police state, and there are few places that are safe anymore. A good test is this: if you live in a community that has welcomed the trappings of the police state with open arms (surveillance cameras, forced DNA extractions, Stingray devices, red light cameras, private prisons, etc. ), all the while allowing its police forces to militarize, weaponize and operate beyond the reach of the Constitution, then you don’t live in a democratic republic—you live in a microcosm of the American police state. If you have no real say in how your local law enforcement operates, if the only oversight of police actions is carried out by fellow officers, if any attempt to criticize the police is edited out or not covered by your local newspaper or TV station, drowned out by your fellow citizens, or intimidated into silence by your local police, then you have no recourse when it comes to police abuses. Finally, if, despite having done nothing wrong, you feel nervous during a police encounter, you fear doing or saying the wrong thing in front of an officer will get you shot, and your local police dress and act like extensions of the military and treat you like a suspect, then it’s safe to say that you are not the one holding the upper hand in the master-servant relationship anymore. This is the death rattle of the American dream, which was built on the idea that no one is above the law, that our rights are inalienable and cannot be taken away, and that our government and its appointed agents exist to serve us. What disturbs me the most is how the lack of oversight when civilians are attacked/killed by a police officer. Nobody in the department wants to figure out why it happened, and re-train their officers to prevent that from EVER happening again. It’s just business as usual with paid-leave for a few weeks. I honestly doubt there would ever be a situation where a civilian is justified in shooting an officer, as they fear for their life because of an “agressive look”, or “barking dog”, or because of hurtful words uttered.